Wouldn’t it have been fairer to choose a few minutes of one of Furtwängler’s own pieces to balance out the supposedly awful piano quintet? Or was Wilhelm just that uninteresting as a composer? I’ll admit that until this month, whenever I heard Furtwängler’s name, I thought not of composing but rather about two other things: conducting and Nazi Germany.1 Much has been written about the German musician’s complex relationship with the Third Reich and his position as the regime’s favored orchestral leader. Though the debate about his politics rages on, Furtwängler’s status as one of the 20th century’s greatest conductors is firm and secure. But the maestro’s own music doesn’t get much respect. It tends to be easy to beat up on composers who are actually more famous for their performing. It’s as if you can only be really good at one of the two activities, and once you choose conducting, you might as well not bother writing your own stuff.2 And there may be a few other factors working against our estimation of Furtwängler as a composer. For a guy with a shady political past, perhaps it’s easier to like him for the way he reproduces others’ music than for how he creates his own. 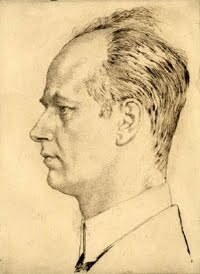 Listening to Furtwängler’s own music might bring us uncomfortably close to a possible Nazi sympathizer. On the other hand, when we hear him only as a conductor, we’re kept at a safe distance, since we’re really just listening to Beethoven, Brahms, or Bruckner. And Furtwängler’s music may be useless for music historians who want to demonstrate “progress” in music in the 20th century. As far as I know, he didn’t experiment with atonality, serialism, or electronics. If something sounds like it could have been written in the 19th century, then that’s already a big strike against talking about it as part of the mid-20th. In other words, it has to do something new or it’s not worth taking seriously. So I felt a little rebellious when I decided to make his Symphony No. 2 (1944-5) one of our first 20th-century Unsung Symphonies. It could be his best-known work. Indeed, it has a flashy 2002 recording with Daniel Barenboim and the Chicago Symphony Orchestra, and I was able to find a score in Harvard’s music library. Someone out there thinks Furtwängler's music is worth hearing. Furtwängler's Second Symphony is chock full of this kind of manipulation of basic scalar motion. It’s certainly not the only thing going on here, but Furtwängler seems to have found a key to keeping listeners’ attention: hammer home something very simple, like an ascending or descending set of notes, and manipulate it in different ways. So next time you want to relax and listen to Bruckner's Seventh, check this one out instead. 1. OK, sometimes I also think of the Lawn Wranglers. 2. See this Norman Lebrecht article, where Gustav Mahler, Pierre Boulez, and Leonard Bernstein are seen as the only famous conductors who could also compose. Even if that's true, I don't know that composing and conducting need to be pitted against each other like that. They seem like two tough activities that require a lot of expertise. It's also surprising when a great composer also turns out to be a superstar insurance agent or something. Gotta tell you, I thought "Furtwangler? Really?" when I saw this title. But I was pleasantly surprised by what I heard, and your useful analysis. I shall check it out further! Cool analysis.Sounds like Furtwängler was trying to rehabilitate musical scales after the mockery of Saint-Saens' Carnival of the Animals "Pianistes." Any idea what's going on with the Barenboim recording cover art? That's what I'd like to know about it. Actualy, I'm not sure about the cover art, or what this symphony has to do with cityscapes. My suspicion is that showing a modern, 20th-century city will somehow make Furtwängler seem like a modern, 20th-century composer. The people who design these covers need to get a lot more creative. There's a story with the cover art. Furtwangler had a planned tour in 1945 which was cancelled due to political circumstances which are easy to understand. One of the emphasis of the tour-to-be was a series of concerts with the Chicago Symphony Orchestra. The very symphony is rumoured to be planned in the concerts. The aerial photo is the Chicago cityscape of the exact year. It is quoted roughly as "this is what Furtwangler may have seen if he made the trip" in the announcement of the CD release. I cannot find the original article of this. But this is what I remember from reading it. Looks a bit boring I admit, but the story convinces. It is interesting to note that having worked in Germany during the Third Reich is always considered "shady", "uncomfortably close to a Nazi sympathizer", etc. If the musician had worked under the socialist regime of Stalin and associates, that never raises an eyebrow. Many fine Russian, Ukrainian, Georgian, etc. musicians made a living performing during the worst genocides in recorded history committed by the Soviet Communists, but that does not attach any onus to the musician who kept producing music that was pleasant to the ear of the satraps in Moscow. Soviet musicians who did not toe the Communist Party’s view on the function of art (to serve the proletariat), were at times marginalized and therefore victimized. However, I am yet to read an account about a Soviet musician having withheld his art in protest of crimes committed against others. As for Furtwängler’symphony, I do not find it Wagnerian or Brucknerian, except perhaps for the vastness of the score. Large ideas sometimes require large containers. Furtwängler has his own tonal idiom. This symphony is a masterpiece that deserves to be more widely known.